Will G-20 walk the talk? Prime Minister Manmohan Singh at G20 Cannes Summit. Photo: Bloomberg. In the week ahead of the just-concluded meetings of the Group of Twenty (G-20) nations at Cannes, two events unfolded. First, Japan intervened in the currency market to shore up the yen, taking financial markets by surprise. Second, even more unexpectedly, Greek Prime Minister George Papandreou announced that he would be seeking a referendum on the bailout package approved for Greece, which required the implementation of politically difficult austerity measures. Naturally, the two-day summit focused almost entirely on salvaging the situation forced upon the world by Papandreou. While officially everybody was silent—in fact, the official communiqué almost ignores Greece, excepting for a passing reference—there is no doubt that Sarkozy and Merkel, backed by an unusually subdued US, eventually restored the status quo by forcing Papandreou to drop the referendum. However, it came at a price. The political economy of Papandreou’s action is that it exposed the structural flaws—and more importantly, it forced a discussion on the fact that Europe is a monetary union, but not a fiscal one —of the European Union, and also revealed how the world is poised on a knife’s edge, especially if we throw in the globalization of discontent against growing inequalities, both within and among nations, and joblessness. So the big question to ask is whether the G-20 summit addressed these concerns: the short-term crisis that is still hanging over Europe and consequently the whole world, and a long-term view on fixing growing inequality. The answer, going by cues dropped by some of the global leaders, as always at the end of such summits is a vague “yes". But then, talk is cheap: the big question is whether the global leaders, several of whom are up for re-election, are willing to walk the talk. 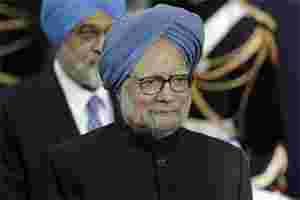 India’s Prime Minister Manmohan Singh at the end of a summit told a press conference, “What I would describe as the outcome of the conference was that the Greek decision not to have a referendum, and the decision of Italy to have the International Monetary Fund (IMF) monitor its programme, it does provide breathing space." The operative phrase here is “breathing space", and that Italy, the fourth largest economy in Europe, agreed to surveillance by the IMF still allows for sovereignty over fiscal policy, but yet mitigates the risk of being blind-sided like in the case of Greece. Arguing similarly, US President Barack Obama in a post-summit press conference said, “With respect to Europe, we came to Cannes to discuss with our European friends how they will move forward and build upon the plan they agreed to last week to resolve this crisis. Events in Greece over the past 24 hours have underscored the importance of implementing the plan, fully and as quickly as possible. Having heard from our European partners over the past two days, I am confident that Europe has the capacity to meet this challenge. I know it isn’t easy, but what is absolutely critical, and what the world looks for in moments such as this, is action." To address the structural issue of inequality, it is clear that the G-20 is looking to do so by putting in place a growth process that will generate more jobs (hope Indian policy planners were listening in, especially since the recent period has seen the phenomenon of jobless growth). And this in turn has been presaged on a rebalancing of global economic growth—a euphemism for getting China and Germany to underwrite the bad times. Interestingly, the action plan for growth and jobs finalized at the end of the G-20 summit has managed to get the Chinese to make such a specific commitment; clearly, this could not have happened without some considerable arm-twisting or plain speaking—it also goes without saying that Obama would have scored major domestic brownie points with this coup. It is a big step forward as it signals China’s willingness to shoulder multilateral commitments. According to the action plan, China has committed to rebalance demand toward domestic consumption, promote a market-based interest rate reform, and move further toward capital account convertibility. “The G-20 welcomes China’s determination to increase exchange rate flexibility consistent with underlying market fundamentals," the note added. As far as the financial markets are concerned, the G-20 summit, despite being sandbagged by Greece, has managed to come out making all the positive noises. The issue is whether the jittery markets have the courage to ask the obvious question: is this all talk, or will there be follow through action? Because, while confidence-building measures are important in shoring up confidence, the failure to follow up with concrete action, most of which is politically difficult to achieve, only means kicking the can further down the street; the only difference is that this time the day of reckoning may be weeks and not months away.